Whew! What a busy week this has been! 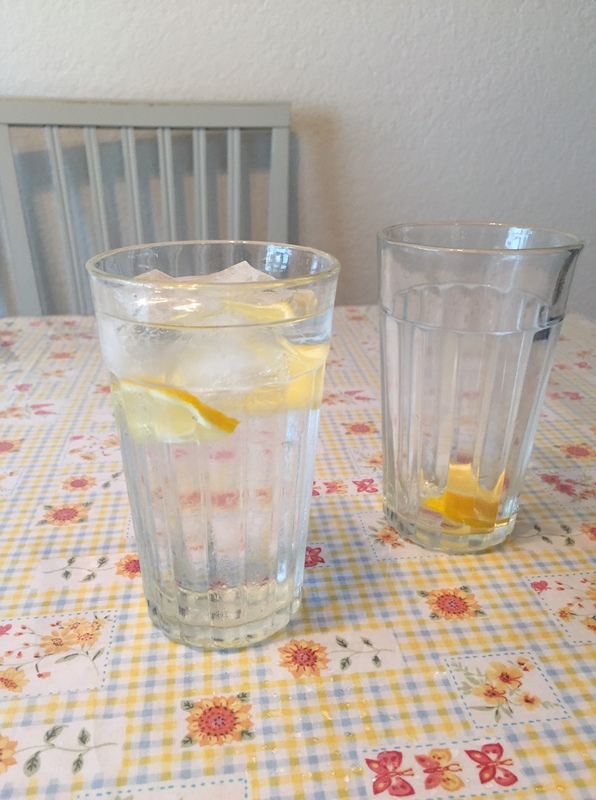 I’ve had several refreshing glasses of lemon-water, and boy did they hit the spot. On Monday, we had a snow day. It is very rare to have one of those at all, especially this late in the year. Although we had 4 inches, it was pretty much melted by 1 o’clock, and we were able to go do some errands. Since my husband had the day off, due to the schools being closed, we took the opportunity to head up to Portland (about an hour away) to pick up some paper cups. They were given to us to use. There were a lot of them (several cases) and we are going to have plenty to share with the youth group at church. A friend has been tasked with cleaning out a warehouse, and these were in there. Some are a bit “shop worn,” but most are in plastic packages, and can be easily sorted. We were happy to get them, and happy to get a time where we could use the several hours it took to pick them up. He needs the warehouse clean by a certain time, so it was get them or lose them. Some of the items in there will be burnt or thrown away if a home is not found for them, but it looked like he was making good progress finding homes for things. I was able to stop by the mall after picking those up and get some clothes, using gift cards I’ve had for quite a while. I didn’t have a lot of time, as Rob dropped J and I off and took Patsy and Jake to Toys R Us to keep them busy, then kept them in the van until we finished. He has the patience of a saint, but, we still hurried. We got some things Ja’Ana needed desperately, and a few tops for me. Mine are getting so worn because I wear the same ones over and over. It’s nice to have some new ones. 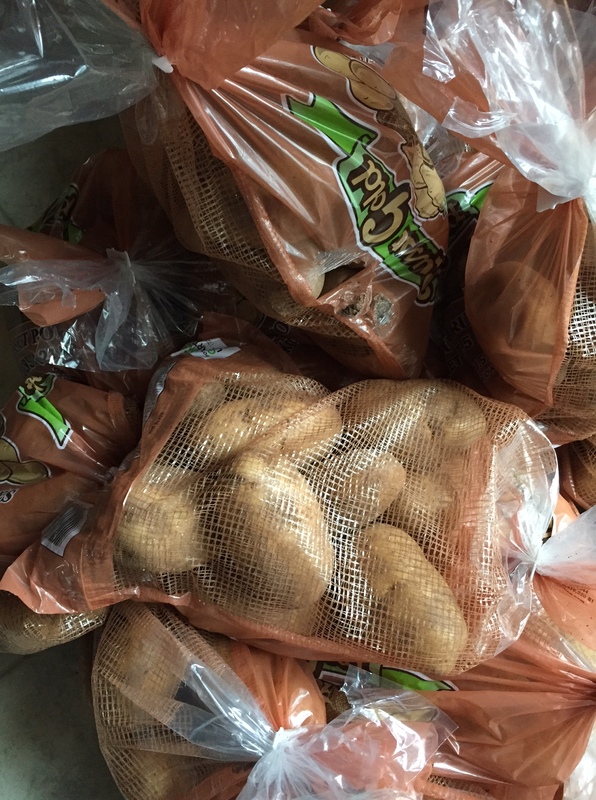 I will post about this week’s grocery challenge on Monday night or Tuesday, but I will say I was very happy to get potatoes for 10c/lb. Rob had found them last Sunday night, and got a few. I went back Tuesday morning and got 100lbs. Needless to say, we’ve had a lot of potatoes this week. We had some friends drop in from out of town, and were able to easily feed them lunch with what I had on hand. I had a couple of hours notice that they were going to eat with us, so I just thawed out some more ingredients for tacos. We had tacos several times last week. I cooked a chicken last night. It was a nice change, although I will say tacos are one of everyone’s favorite foods and I don’t get protests no matter how many times we have them. Jake and Patsy enjoyed some art activities this week. Before Christmas, I got one of those little art kits with several items in it for $3.50 at Michaels. The quality is not high (and the markers are already drying up), but neither was the price. They’ve been using it a bit, and yesterday, they painted. I’m not sure if Jake has painted much with watercolors before, but he wanted some “water” for his current Lego boat to float in, so I gave him a piece of paper and he painted some. He enjoyed it. Patsy painted and drew for a long time, even after he went home. One thing she enjoyed is some watercolor crayons my niece, Rachel, sent along when she cleaned out. I had some card stock, and that is what I gave them to paint on. I also read aloud to Jake several times, re-reading last week’s library books. Since I keep them at my house, he is learning to look forward to hearing the current ones when he comes over. I read part of a chapter book to Patsy. We started it last summer in the camper, and it came to light when I was doing some cleaning, so she wanted me to read it some more. It’s an old Trixie Belden book from my childhood, and she likes it. Both Patsy and Jake built Legos for quite a while. Patsy listened to library books on c.d. She worked on her sewing project, a skirt, for a while one day. We went to the YMCA and exercised while both girls were in their dance classes. On Friday night, Rob took Patsy and Jake swimming. This is the last scheduled overnight for my nephew, Jake, for some time. I’ve had several occasions to keep him over the last month, but now will go back to my regular schedule for the most part. I’ve enjoyed the extra time with him. Last week, I ended up getting Michaela, my niece, from school one day, as she was sick. She watched the movie Cars, which we own, until her daddy picked her up when he got off work. Ja’Ana was able to go to a movie night at church, which was fun for her. She was able to clean house again for money that is put into an account at church towards her summer church activities. She is earning money for both camp and a mission trip. My mom came for lunch and Ja’Ana and Alissa made soup for her to practice their cooking. (They make soup almost every time, and it’s almost always potato- cheddar. They made some broccoli-cheddar as well this time. There’s a theme here. Let’s hope I never run out of cheese. Good thing Grandma is a good sport!) I also showed them how to make a simple cornstarch chocolate pudding, using the microwave. The recipe is from my “More With Less” cookbook, which I’ve had for years. Our tax refunds both came already. They came super fast, so we were delighted. We’ve got good plans for the money. One thing that we will do is get some maintenance done on the van, as well as new tires. Our power bill went down by about 25%. It was really high last month, and we turned a few things off, worked on shorter showers and lights off, and what ever else we could think of to cut it down. The weather was slightly warmer and the days are getting longer, which all helps, too. Rob had more dental work done, using our insurance, and now has his permanent crown from the tooth he broke. Again, that is such a blessing to have dental insurance after so many years without. Although we still have co-pays, they are so much less than we used to pay. It’s my turn this week to get my broken filling fixed. Last fall, Patsy planted about 50-100 daffodil bulbs next to the sidewalk. They were from my sister’s yard, so were free. They have started to bloom. They are such a cheerful yellow. There are many that did not bloom this year, but she spaced them nicely, and next year they will fill in even more. I also have several other bulbs that came up and are blooming in the flowerbeds. Your picture with the ice water and tablecloth is so pretty! I don’t comment that often, but love each post. I am surprised you had another snow day. It is finally warming up here (northern AZ), and just in time for spring break. I took the week off, as my husband and kids have it off, and I, just so happy for us to have some time together. It has not been a frugal week. My daughter got news Friday that she was accepted into the University of Arizona nursing program, so we went out Friday night to celebrate. I am so proud of her hard work to get it! They have a 20% acceptance rate. Yesterday we went to a spring training baseball game – Cubs versus Rockies. I packed snacks, but we planned one meal out. When we got into the game, I was so thirsty (hot for us there). Four water bottles were $18. However, I now know that you can take sealed plastic water bottles in, so I will do that next time. In any case, we were given the tickets, so it was still not that expensive for us. We took my daughter’s boyfriend rather than our younger daughter (she didn’t want to go and had the SAT anyway) and I am thankful he is happy with snacks brought along, etc. Anything else we do will be low or no-cost, but will just be so wonderful to go at a slower pace. Have a good week! That’s why you save money on other things–so you can have a wonderful time when you decide to spend some–with no guilt and no worries! I’m glad you had a great time when you went out to dinner, and at the game. Water bottles are expensive at games, etc. It’s nice to know you can bring some. Still, if you forgot, it’s better to get some than to get sick. That ‘More With Less’ cookbook is a gem, I need to get that out and give it a look for some new recipes. That is great that all the dental work is getting done. I got my permanent crown last week too and I am so thankful to have it done. Our gas grill had stopped working so my husband rolled it into the screen porch so that he would have a table near by and patiently took it all apart and cleaned it and put it back together. Now it works as good as a new one. Savings of about $300 over having to buy a new one. This was a good project for him right now. Something accomplished but not too taxing. Our daughter and her husband came and helped fix our fence that was damaged in the storm. Materials were $70. I suspect we saved hundreds over having a fence company come and fix it. I finished up the last of the buttermilk and put 1/4 cup of the last batch and milk that was at it’s date to fill the quart jar and cultured a new batch. This homemade buttermilk is wonderful and keeps very well. We have never liked reheated biscuits until I started making them with my homemade buttermilk. Now they reheat and taste wonderful. We ate out much less this week so that was a big savings. My husband was cleared by the company medical center to work half days 5 days a week from home until he goes back next time. He has done well with it and our schedule feels a bit more normal. We had a bit of late snow overnight here. I am afraid the peach crop will be lost as the trees are all in bloom and we will have very cold weather and lows in the 20’s this week. You had a great week! It is especially awesome that your husband could fix the grill. Rob loves to grill and he makes so many terrific meals when he can. Last year, before we moved, he replaced his grill as the old one was completely worn out–non-fixable anymore. Ouch! So, I’m glad yours could be fixed. I hope the peaches don’t die! I grew up on a peach farm, had a family peach farm as a grown-up, and still have a sister with a peach farm, and I know the devistation of crop loss to the farmers. I know what you are saying about the farmers. I hate it that they bloomed so early. So many orchards are gone over the last ten years because of late frosts. They have been taken out and now there are housing developments in their place. UGH! We used to take the kids to pick peaches and now that farm is hundreds of houses on 1/4 acre lots. It makes me sad. Hopefully, the farmer got a ton of money, at least, for their property! Having grown up selling peaches and cherries u-pick, I have a lot of nostalgia for that lifestyle, as well. Even though we don’t live there anymore, it is nice that the peach orchards still exist and they are still selling fruit. However, the trees are different ones from when I was a child–they have had to be replanted and refreshed over the years. Gotta love it when a snow day turns into a fun paid vacation. I don’t think my family would complain about eating tacos often either. For us, chili is the go-to quick easy meal. As a grandma, I know I would be very happy to eat soup every time my granddaughters made it. It’s so nice to read that you are enjoying your new home and the activities that are nearby. will be cold all week..
We used to get 200 lbs in the fall, from farmers, when the big kids were little and use them up before the winter was over. I love them WAY too much. We’ve already used about 15-20 lbs or more. We’ve made mashed potatoes, Lovana made fries for herself and Rob (lots), I baked a few, and made oven fries one night for dinner. When she left tonight for her 5 days at work, she carried a bag with her:) She likes to take her own food, as she likes to eat a certain way. We have been having tons of rain here and it looks like this week will be no exception. Our rivers have already flooded once and it is looking like we have more to come. Good thing it is not affecting my Spring bulbs though. I have snowdrops up and noticed that my crocuses are all coming up now too. 🙂 Be blessed! I’ve never tried tacos on potatoes, but may be trying that before these are gone! That being said, we’ve already used 15-20 lbs, so I’m not worried. I need to get some snowdrops for this property. That is one bulb I’ve always had, but is not here.